This site is best viewed in Internet Explorer, Google Chrome, or Safari web browsers. Refresh your browser to be sure to have the most updated pages. 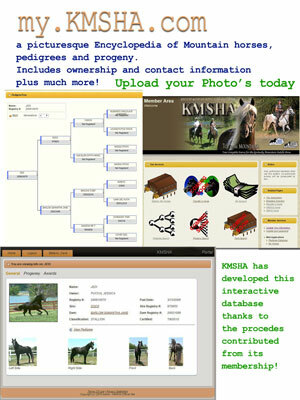 KMSHA’S DEFINITION OF BREEDER- At this time, the definition of "Breeder" as established by the KMSHA/SMHA is the person who owns the Stallion at the time of the breeding and verifies that the mare has been bred to that Stallion by affixing his signature on the official breeding certificate. The "Breeder’s" name will be affixed to the KMSHA/SMHA official registration certificate of the foal as a result of the breeding. 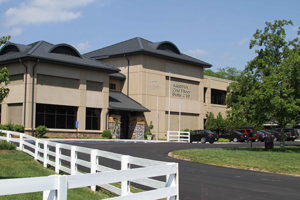 KMSHA’S DEFINITION OF OWNER - The "Owner " is the person who’s name appears on the current KMSHA/SMHA official registration certificate of the horse and may change from time to time as the horse is either sold or transferred and documented and dated as such by the Registrar of the association. Note: If a horse is sold or transferred and the new owner does not transfer the horse into their name, the KMSHA/SMHA will treat that horse as still owned by the last owner on the official registration certificate until proper transfer is documented and dated by the Registrar of the Association. Any award money, offspring documentation or credit recognition for that horse will go to the previous owner. 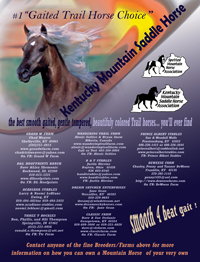 View the latest Trail Rider Magazine ad. Trail Rider's Club Renewed Membership and New Memberships 500 and 1,000 Mileage Pins awarded. Get a free ball cap for joining the Club, get an award pin for achieving the mileage categories. Click for more information.